I was intimidated when I started this book. I know I’m imbalanced; I can feel it. I think you can feel it too, when you’re out of balance. If not, take some time to listen to your body. My shoulders and neck are stiff. My head hurts. I’m not sleeping well. I eat more junk food. My house becomes cluttered. My kids argue with one another and I become very short-tempered. I find myself planning for the next day rather than the next week. Have you been there? Of course you have. If you’ve not, you’re lying. Yep – I just called you out. We’re educators; imbalance is a way of life. 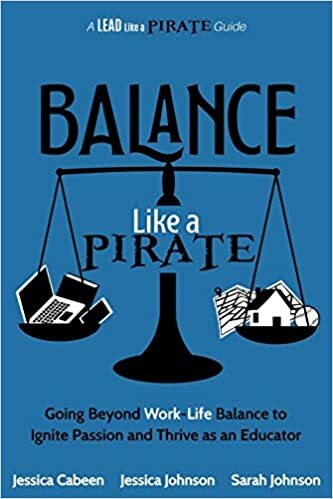 Thankfully, Jessica Cabeen, Jessica Johnson, and Sarah Johnson share their stories in the third Lead Like a Pirate guide book, Balance Like A Pirate. Personal – Who are you? Outside of your job, what titles do you hold? Positional – What is your role at your job? What pays the bills? Professional – How do you continue to grow and learn your job? Passions – What gets you out of bed? I took time while reading to dive into these quadrants and define them in my own life. There are some excellent activities the authors share to help us think through where we currently are in our balance, and where each piece of ourselves fits in the quadrants. Personally, I am a wife, mother, caregiver of a child with Type 1 Diabetes and high functioning autism, daughter, sister, aunt, granddaughter, niece, cousin, Christian, nursery worker, and friend. Positionally, I am a digital learning coach and a media coordinator. I work with teachers and students in my school, as well as partnering with administration to bring about meaningful and sustainable change in our school. I also lead district and state level professional development. I serve on our ISTE state affiliate board of directors and am a Future Ready Thought Leader in Instructional Coaching. Professionally, I read books and connect with my PLN to provide my own growth. #DBC50Summer and #DBCBookBlogs have been the main instrument for growth, in addition to Twitter chats. I enjoy attending edcamps. I attend state level conferences and would like to attend a national or international conference in the near future. Finally, my passions include reading and writing, watching football, and connecting with others. Like many of you, I’ve got a lot on my plate, so to speak. I drop the ball every day on at least one of these quadrants. I’ve got to get better at this balancing act, and this book was exactly what I needed to help me make small steps to see big changes in each of these areas. There is so much I enjoyed about reading Balance Like A Pirate. The practical advice at the end was definitely the highlight for me. As a believer in the quote from the Captain himself, “Inspiration without implementation is a waste,” I was thrilled to see the final section devoted to ways to readily implement the ideals and philosophies held within the pages of the book. I will be implementing many of these in the near future. My official implementation plan for this one is a bit different from the ideas given at the end of the book. With this in mind, my implementation for Balance Like A Pirate will be very similar. I will take a pulse of my commitments and my time in each quadrant by writing down what I am doing each day. Every 30-60 minutes, I will take a short pause for reflection writing down which quadrant I have been focused on. If there have been multiple quadrants addressed during that specified time, I will note that. I will do this for at least one week, possibly longer, until I see a clear picture of where I currently stand in the quadrants. I’m not sure which quadrant I’m spending the most time in right now, but it is clear that my personal quadrant is being neglected the most. If you’re a parent and an educator, you likely feel the same convictions I do when it comes to our own children. My daughters get the worst version of me. They unwillingly make so many sacrifices because their mom is a committed educator. They need me to be a committed mom. I come home exhausted from answering a million questions, dealing with middle school drama, and pouring my heart out for my students, and there’s just not a lot left when we get home. After working until 4:30-5:00 every evening, we come home to quickly do homework, grab something quick to eat, go to whatever ball practice/game is on the schedule for the night, then come home for showers and bedtime. They deserve better from me. This much is evident without even taking a pulse on where I currently am in my imbalance. Once I see where the majority of my time is being spent, I can better adjust using ANCHOR Goals (described in this book, it’s the equivalent of a SMART goal for balancing our lives) without eliminating my time in the quadrants altogether. I look forward to seeing what comes from my time with this book. I am excited to spend more time with my family, but fearful of what that will do to my professional growth. I’m not going to lie, I’m looking forward to sleeping again, ha! Also… that freaking out chart… that thing is on point! You’ve got to see this thing in the book! It’s pretty much perfect! Head on over to the Dave Burgess Consulting website to preview this book! You can follow along with others going on this journey working toward achieving a better balance using the hashtag #BalanceLAP and following Jessica, Jessica, and Sarah. You may also check out their websites! Jessica Cabeen’s is here, Jessica Johnson’s is here, and Sarah’s can be found here. Jessica Johnson’s website has a list of podcasts she has appeared on, as well as her own podcast, Principal PLN. Sarah also includes podcasts and publications here. I highly recommend purchasing this book for yourself and for a friend. Being sure that both of you have a copy gives you the opportunity for immediate accountability partners who will speak the same language. Oddly enough, my accountability partners are people I’ve never even met; you all. You are my accountability partners in that you pushed me to finish #DBC50Summer, and you are currently encouraging me to follow through on the implementation plans I created for that, and the rest of the #DBCBookBlogs and you may not even be aware that you’re inspiring me to complete this journey. But you are. And I appreciate that. Continue to follow along with me. There are only a few books left (I’m sure more will be coming very soon, but at least for now I’ll be caught up). As always, Andrea Paulakovich (creator of the flipgrid for all DBC, Inc books) and I invite you to share your thoughts on the flipgrid for Balance Like A Pirate. The next book is Kim Bearden‘s Talk to Me. I’m beyond excited about this one. I have heard that I’m going to love it, so I’m eager to see if it will live up to the hype from my dear friend who suggested it. Also – there’s a special something in store for this blog!!! Stay tuned!